i created a webapp project using maven in eclipse. when i run the command mvn package in command prompt it showing folowing error. Run->Run configurations->Fill in Name, Base directory and Goals. Or as @PawanKumarBaranwal suggested, set your default JDK. But care if you have more than one JRE configured. Try this. 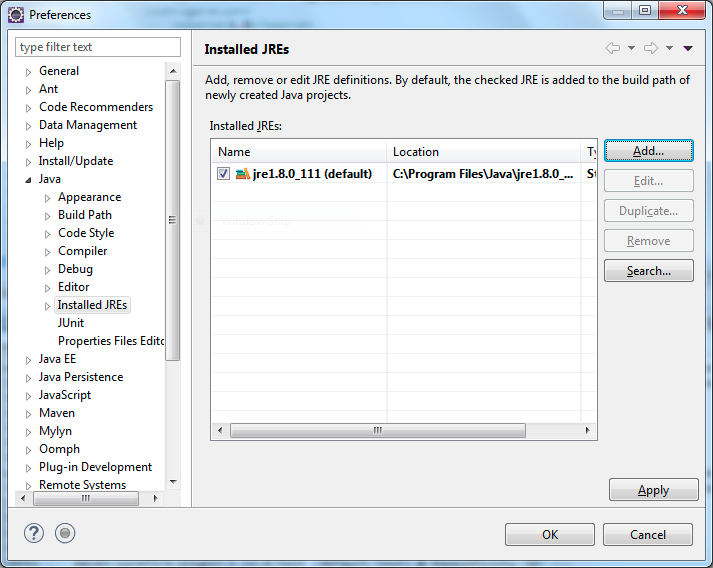 Go to Window --> Preferences --> Java --> Installed JREs. 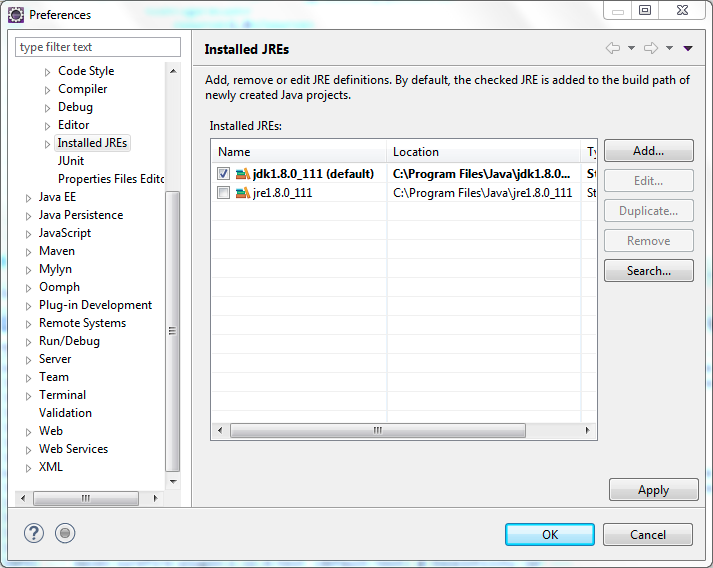 Double click the JRE, which is inside installed JREs. Give the JDK path (for example, C:\Program Files\Java\jdk1.7.0_80\) in JRE Home, and give JRE name as JDK. Click on Finish and then OK. In my case, the error "No compiler is provided in this environment. 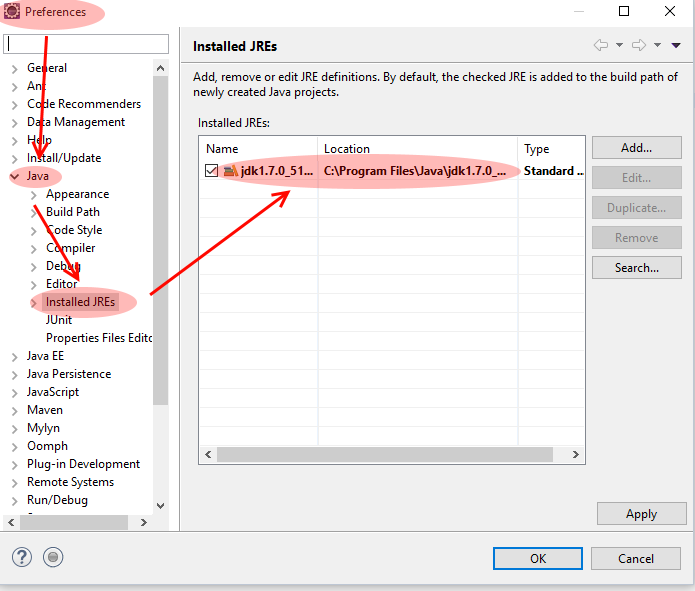 Perhaps you are running on a JRE rather than a JDK" was due to the JRE being installed in a different location than its default under the JDK. Running under 64-bit linux, I have Oracle's 64-bit JDK SE 1.6.0_45 installed at /opt/java. The 32 and 64 bit JRE's were installed at /opt/java/jre32 and /opt/java/jre64, with a jre symlink: (ie. ln -s jre64 jre), sojre ->./jre64(meaning/opt/jdk/jrewas a symlink referencing/opt/jdk/jre64). Once I renamed jre64 to jre (ie. rm jre ; mv jre64 jre ; ln -s jre jre64), this problem went away; and I was able to build using maven (inside of netbeans). Maven appears to be looking at the JRE path, saying "jre64 isn't the correct name for a default JRE-inside-of-JDK install, so assume a JDK doesn't exist at ../"), which would prevent it from resolving the location of the JDK lib directory containing tools.jar, etc. 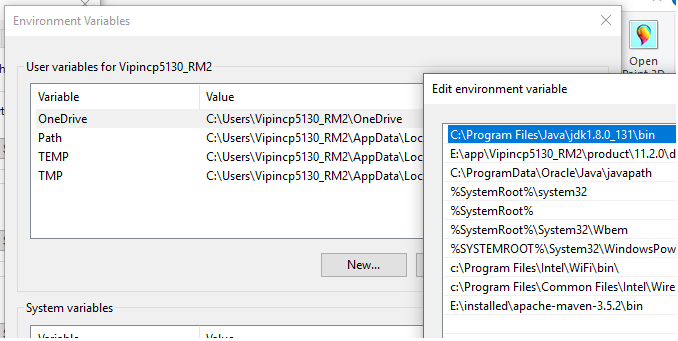 Haven't tested it, but the same thing might happen under Windows if the JRE isn't in the default location (or perhaps isn't in the %JAVA_HOME%\jre directory). If both the JDK and the JRE are installed, Oracle's installer wants to install the JRE at %JAVA_HOME%\jre6, not %JAVA_HOME%\jre. That may be because the \jre directory is needed for the JDK uninstall process; if the JRE has been installed on top of the JDK's JRE in the \jre directory, instead of at \jre6, uninstalling the JDK after the uninstalling the JRE will fail unless the \jre directory is copied, JRE is uninstalled, and the \jre copy is restored to \jre. keep jdk's path at first place in path variable, so that other java path will be ignored. compilation error will be resolved. These all likewise pointed to the JRE instead of the JDK. Once these edits were made, I could build projects in the second workspace from within Eclipse, not just from the command line. 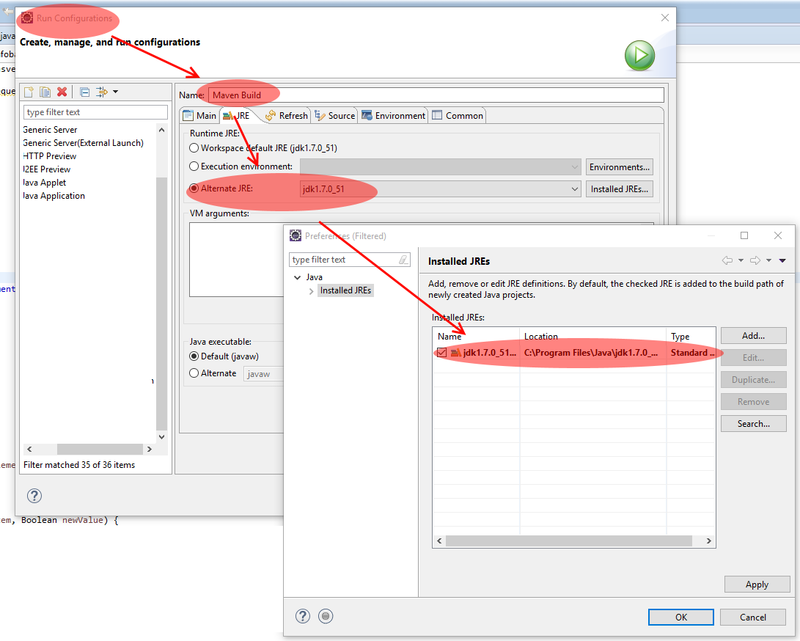 I'm using maven plugin for Eclipse (V3.3) and was struggling with this error for a while. I finally found the solution which is linked to stale java sources: it has nothing to do with JRE or JDK (I use JRE 1.7). I found on other forums that it is a known problem in maven-compiler-plugin (same result for V3.3 and 3.5.1). So, I just recompiled manually the stale source(s) and ran again the goal, this time without any problem. indicating a java class file (to be recompiled manually...). Hope this can be useful as the message given by maven compiler made me search in a wrong direction (play with JRE, JDK, JAVA-HOME, etc). Not the answer you're looking for? Browse other questions tagged java maven java-7 or ask your own question.